THOUSANDS of revellers heading to a 13-hour rave in Ingliston today have been warned sniffer dogs will be on patrol to weed out drugtakers. Officers will be on duty at the ‘Rezerection – One Night Only’ event at the Royal Highland Centre with up to 5,500 dance music fans expected. 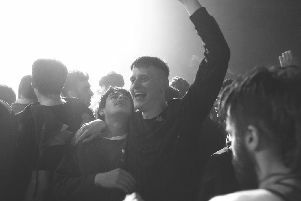 An event at the same venue last year sparked condemnation from police after party goers were thrown out for taking drugs were allowed back in. Chief Inspector Jordana Emerson, Event Commander for Rezerection, said: “We have a wealth of experience in policing the large-scale musical performances that take place at the Royal Highland Centre and we are confident this will be a safe and enjoyable event for those in attendance. “The public have a vital role to play, however, in helping us keep everyone safe by ensuring they do not behave in a manner that puts themselves or others at risk. “Rezerection’s organisers have made it perfectly clear that they are operating a zero-tolerance policy in relation to drugs with full searches in place for everyone entering the venue, supported by ourselves. “Should you be found in possession of any illegal substances or any other illicit items, then you will be refused entry and will face arrest or other appropriate police action. “While the Royal Highland Centre has visitor parking, a large event like this will mean lengthy waits to enter and leave the car park, so where possible, please consider utilising public transport. Edinburgh’s buses, trams and taxi services can drop you off close to the arena entrance and will cut down any waiting times in relation to parking or exiting the venue. “Our Police Scotland website has a lot of really useful advice on keeping yourself safe during a night out and making sure you get to and from your event safely. More than 50 artists and DJs set to perform throughout the 13-hour event with doors opening at 1pm and the final performance ending at 2am on Sunday. Police are expected to patrol inside and around the venue and manage traffic around Ingliston. Revellers are urged to plan their journey in advance and ensure they know how to get to and from the arena. Anyone carrying drugs or weapons will be barred and face further police action. Drugtaking revellers were allowed back into last year’s Terminal V Festival at the same venue. No one at Rezerection was available for comment but organisers issued a safety warning on their Facebook page.